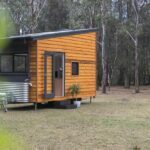 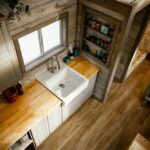 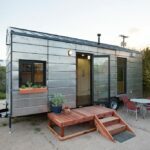 Tiny Houses Single Loft by TexZen Tiny Home Co. 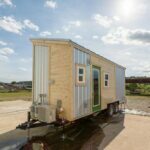 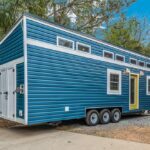 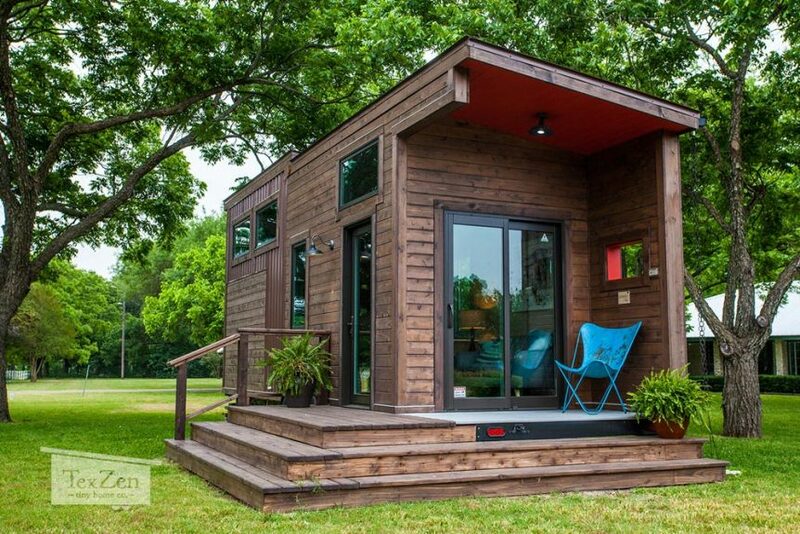 Single Loft by TexZen Tiny Home Co.
From Austin, Texas-based TexZen Tiny Home Co. is the Single Loft tiny house on wheels. 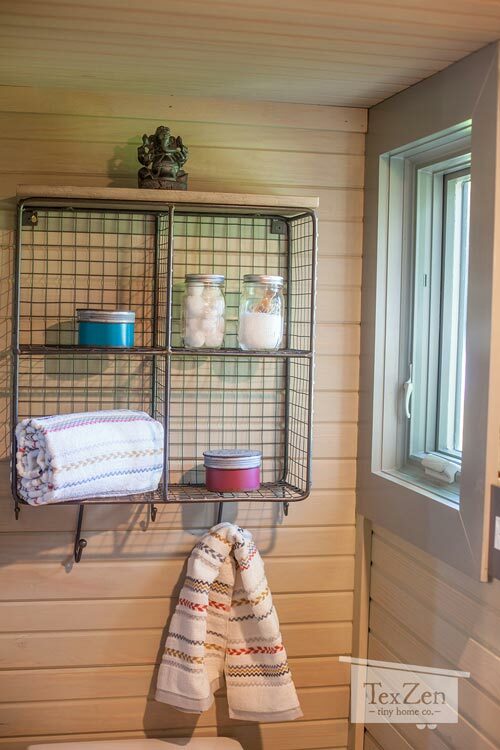 The rustic modern exterior combines gorgeous dark stained wood with a metal accent piece. 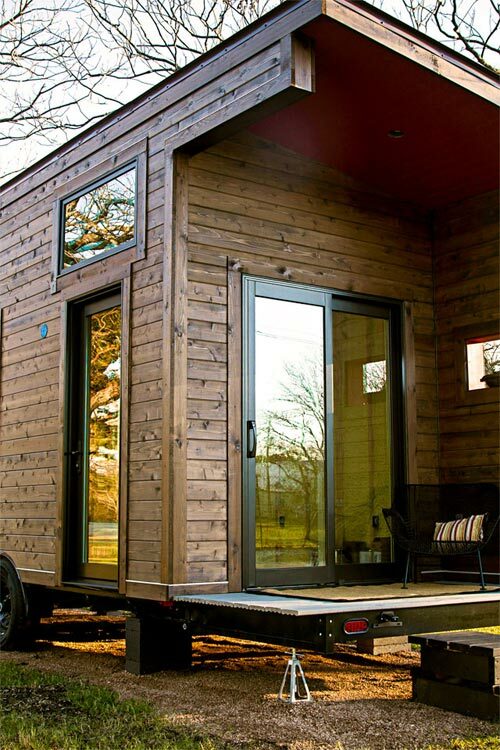 A full light side entry door and sliding glass door allow plentiful sunlight. 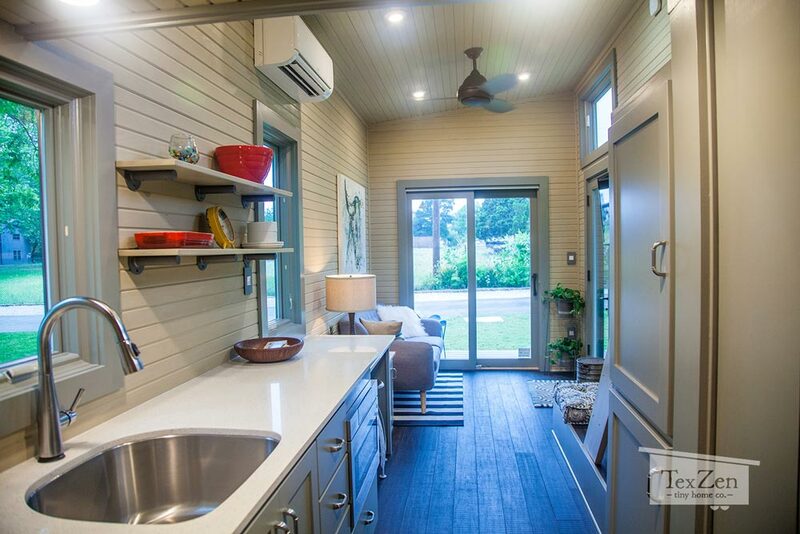 The sliding door opens onto a covered porch. 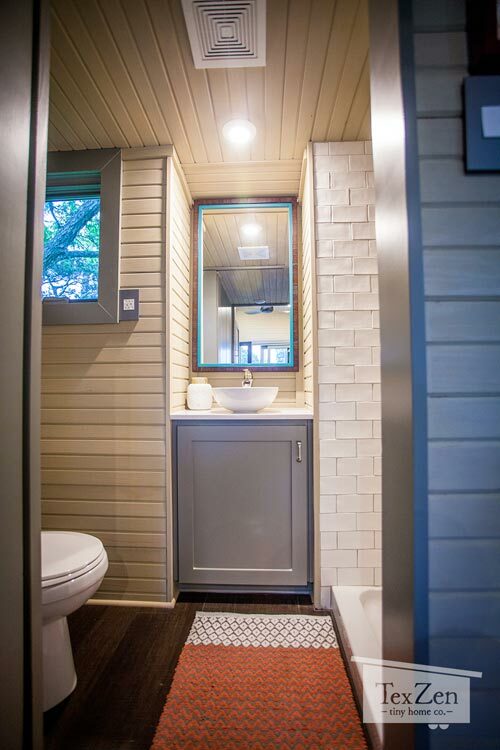 As you enter the Single Loft you’ll find bright, off-white painted tongue-and-groove walls and ceilings, dark wood flooring, and grey trim and cabinetry. 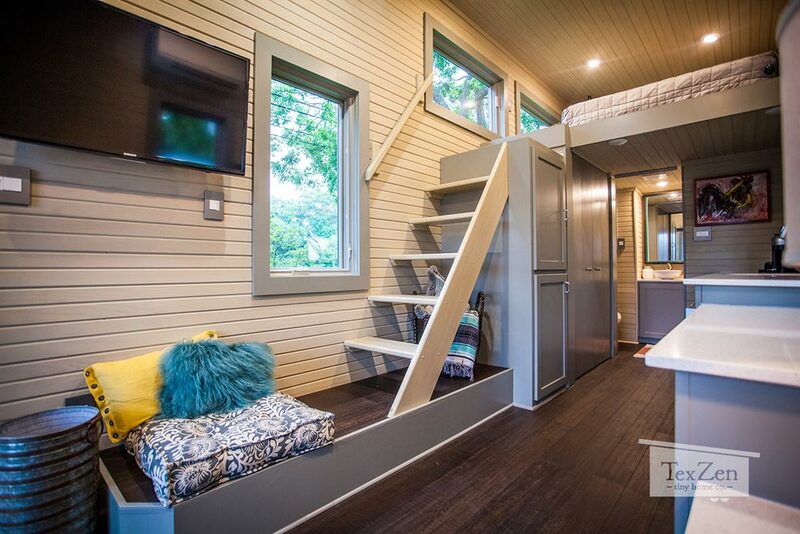 Directly in front of the entryway is the living room with space for a couch and wall mounted TV. 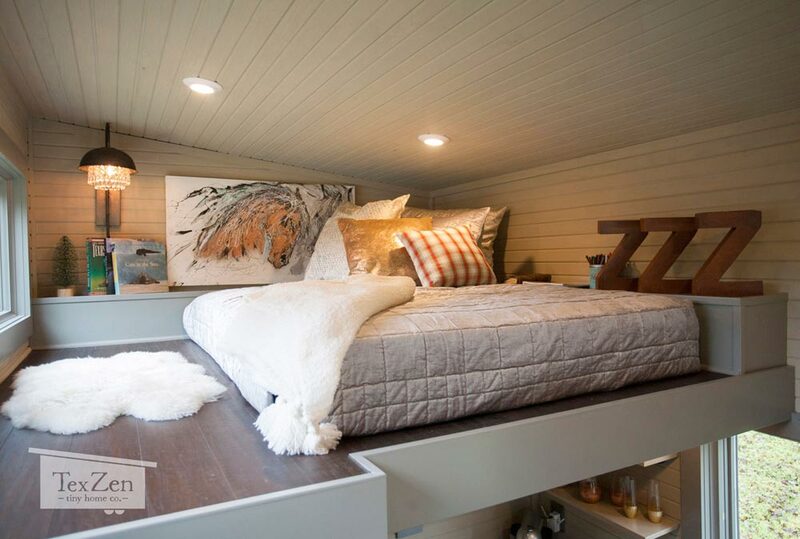 Another sitting space is below the TV. 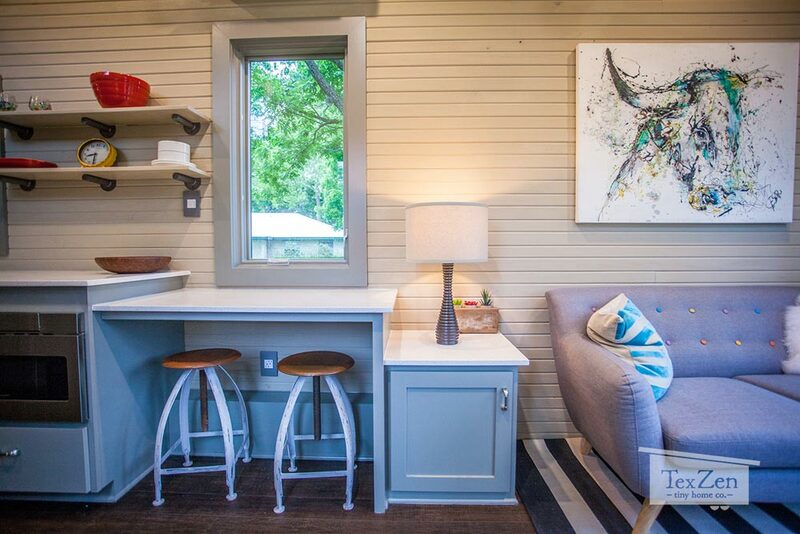 A three-tier counter space combines an end table, desk/table with two bar stools, and the kitchen counter. 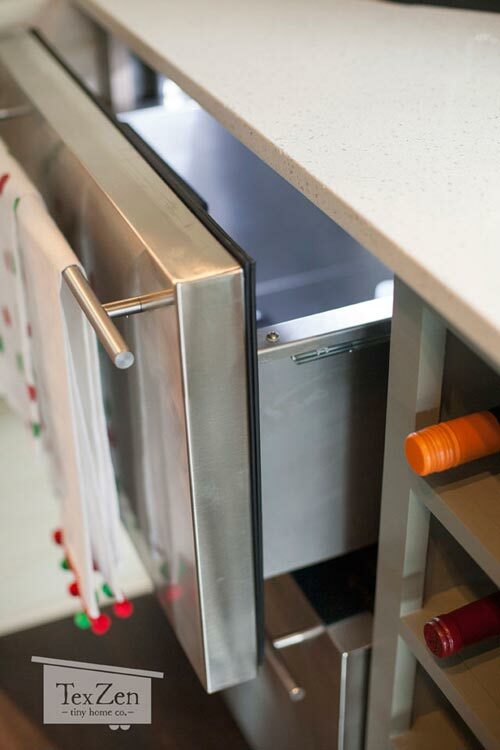 In the kitchen is a convection microwave oven, deep stainless steel sink, and under counter refrigerator/freezer drawers. 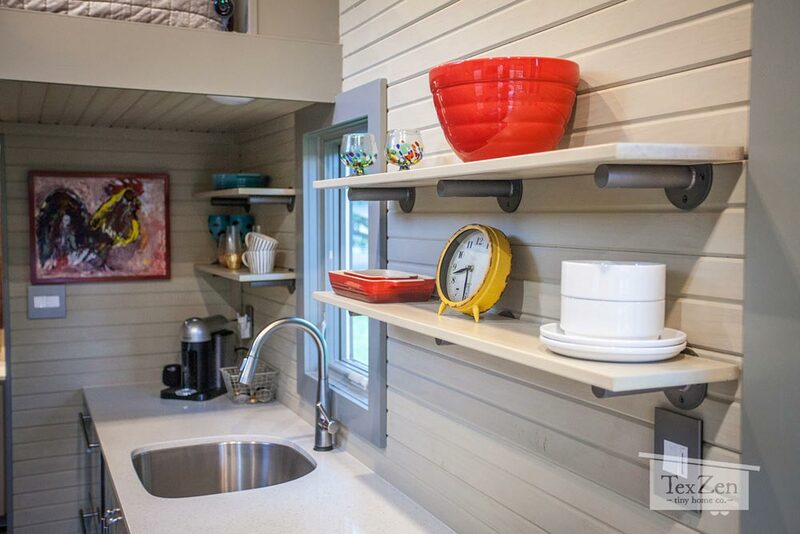 Behind the kitchen is a large storage area with space for a washer and dryer, plus two big cupboards under the loft stairs. 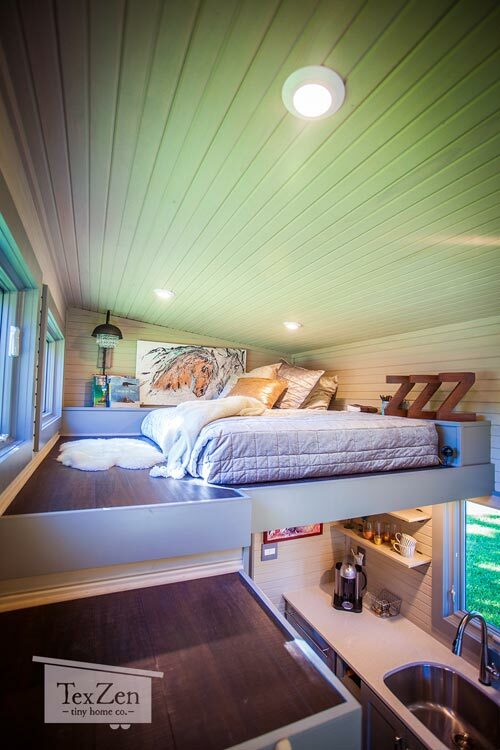 The bedroom loft has large windows on one side and a shelf that wraps around two sides of the bed. 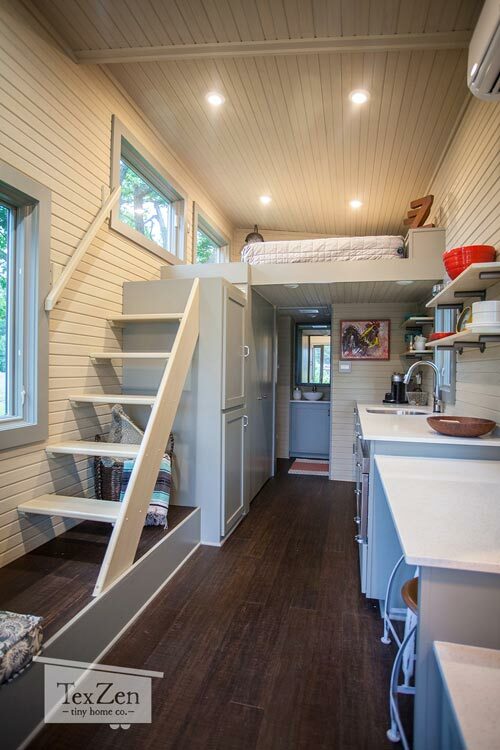 This section of the house has a shed style roof, allowing for extra headroom as you walk up the stairs. 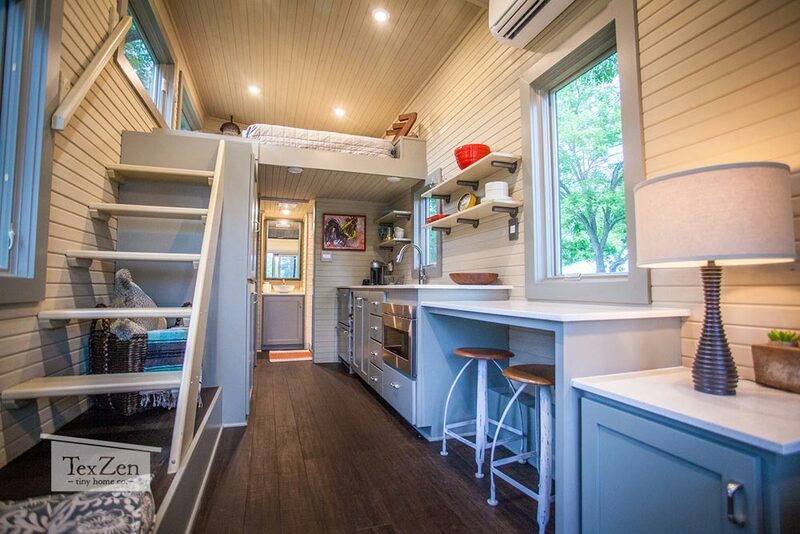 The Single Loft ranges from 22-28 feet and starts at $65,000. 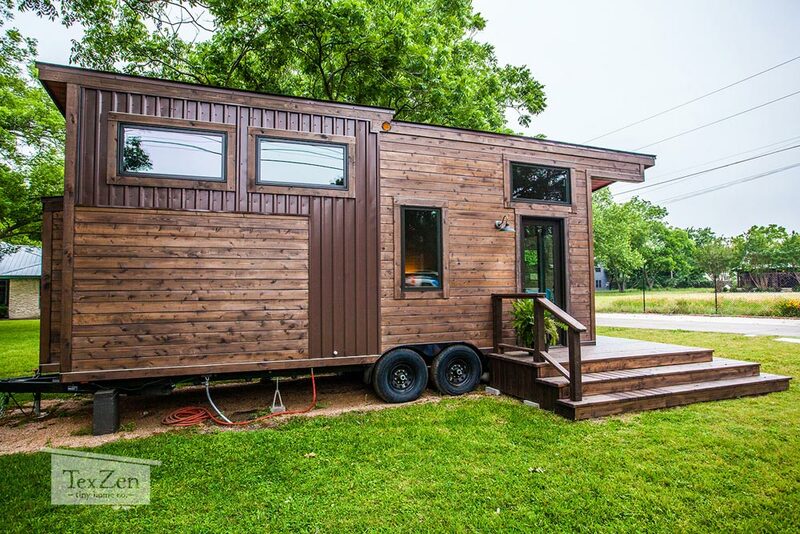 Also available from TexZen Tiny Home Co.: Open Concept. 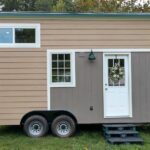 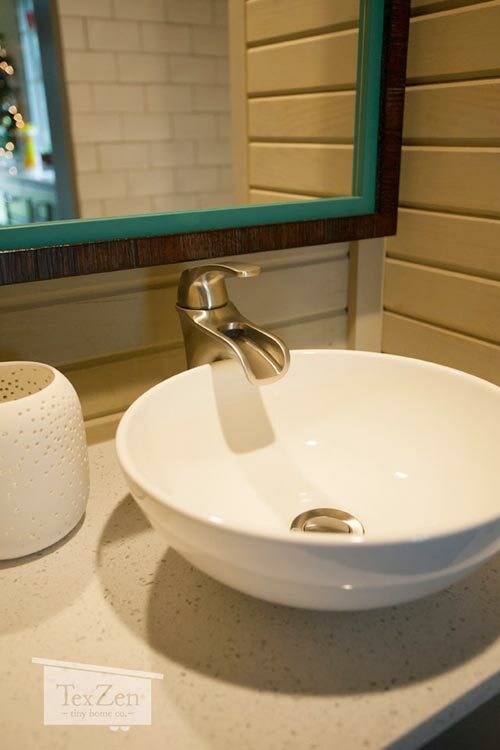 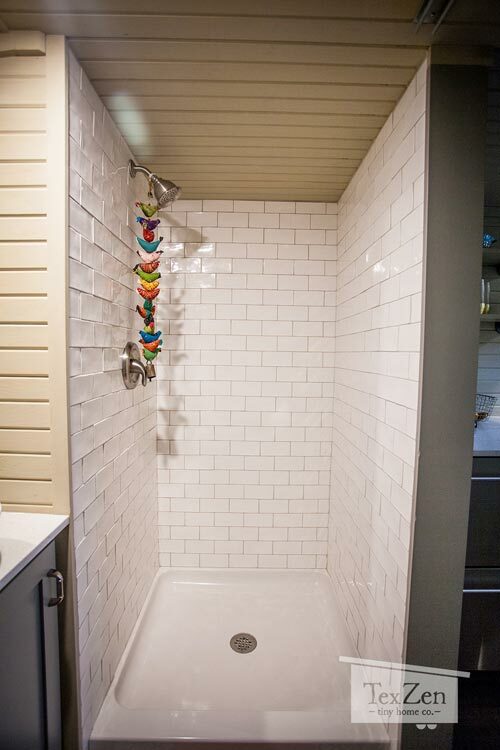 Images © TexZen Tiny Home Co.